The movements of the stars and the planets have almost no impact on life on Earth, but a few times per year, the alignment of celestial bodies has a visible effect. 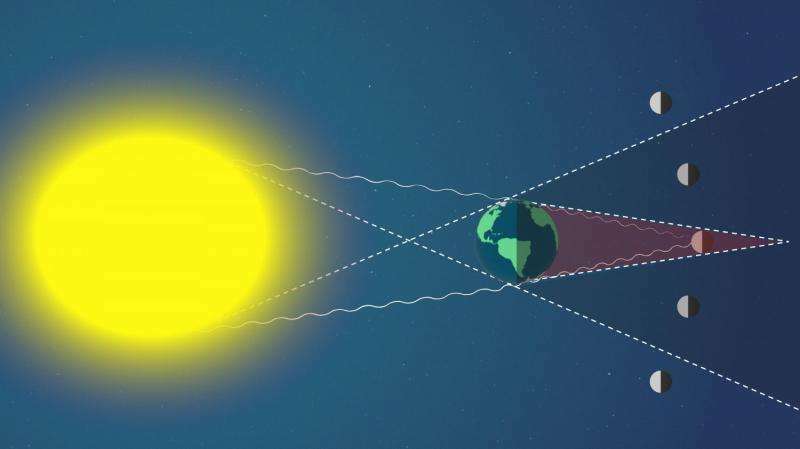 One of these geometric events—the spring equinox—is just around the corner, and another major alignment—a total solar eclipse—will be visible across America on Aug. 21, with a fleet of NASA satellites viewing it from space and providing images of the event. Earth spins on a tilted axis. 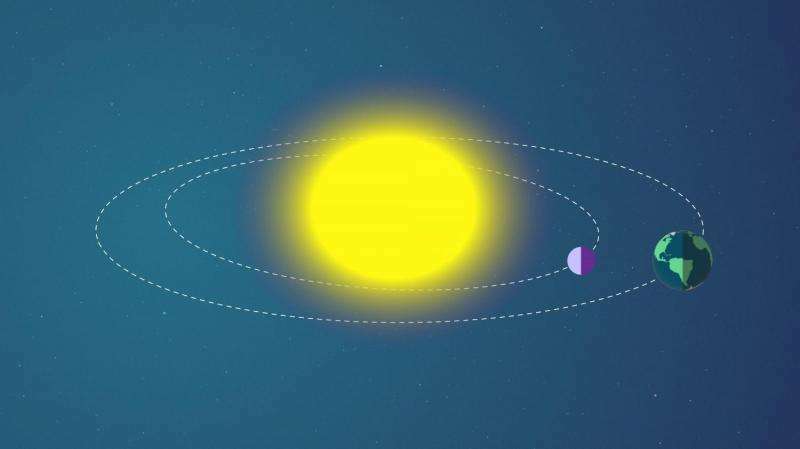 As our planet orbits around the sun, that tilt means that during half of the year, the Northern Hemisphere receives more daylight—its summertime—and during the other half of the year, the Southern Hemisphere does. Twice a year, Earth is in just the right place so that it's lined up with respect to the sun, and both hemispheres of the planet receive the same amount of daylight. On these days, there are almost equal amounts of day and night, which is where the word equinox—meaning "equal night" in Latin—comes from. 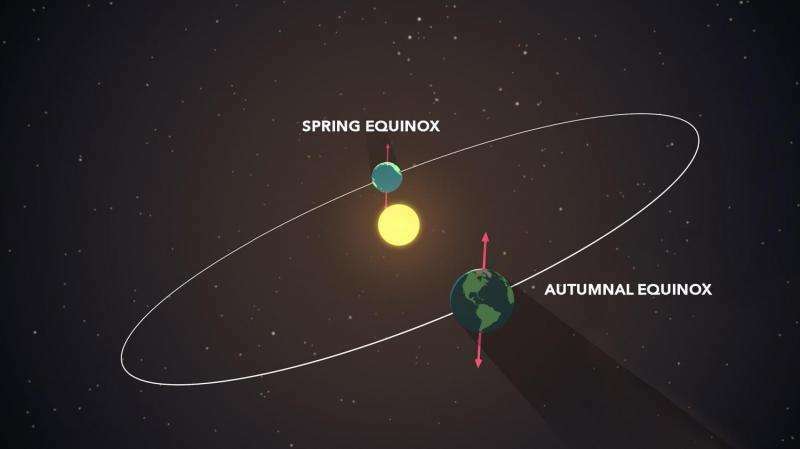 The equinox marks the onset of spring with a transition from shorter to longer days for half the planet, along with more direct sunlight as the sun rises higher above the horizon. In 2017, in the Northern Hemisphere, the spring equinox occurs on March 20. Six months later, fall begins with the autumnal equinox on Sept. 22. 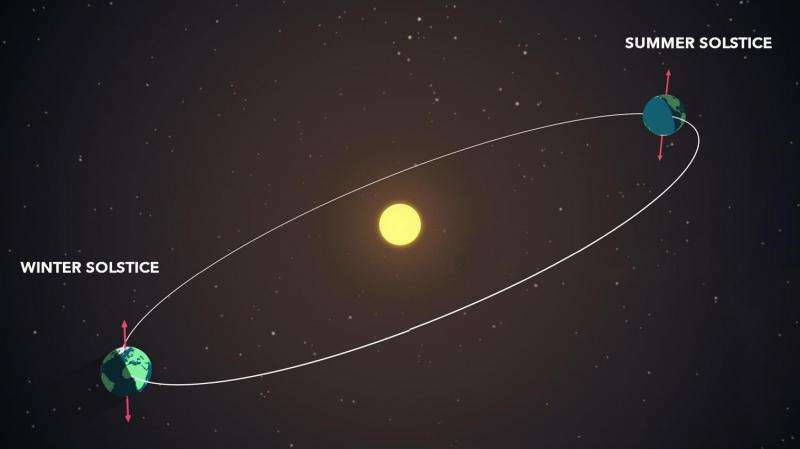 As Earth continues along in its orbit after the equinox, it eventually reaches a point where its tilt is at the greatest angle to the plane of its orbit—and the point where one half of the planet is receiving the most daylight and the other the least. This point is the solstice—meaning "sun stands still" in Latin—and it occurs twice a year. These days are our longest and shortest days, and mark the change of seasons to summer and winter. As Earth goes around the sun, the moon is also going around Earth. There is a point each month when the three bodies align with Earth between the sun and the moon. During this phase, viewers on Earth can see the full face of the moon reflecting light from the sun—a full moon. The time between full moons is about four weeks—29.5 days to be exact. Halfway between full moons, the order of the three bodies reverses and the moon lies between the sun and Earth. 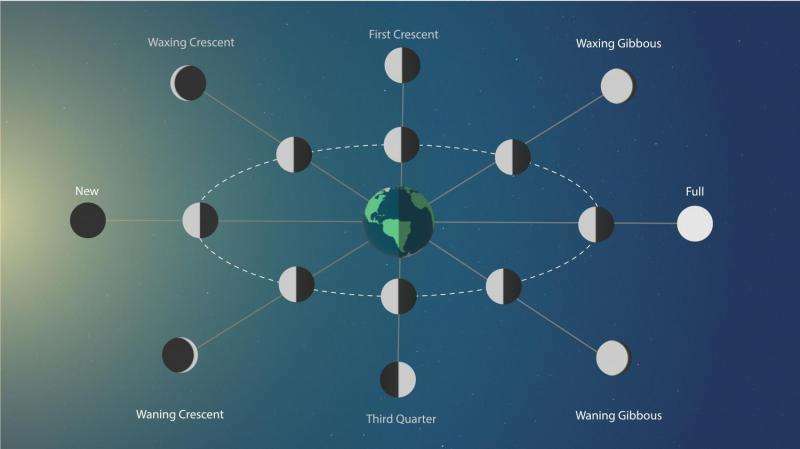 During this time, we can't see the moon reflecting the sun's light, so it appears dark. This is the new moon. Sometimes, during a full moon, Earth lines up perfectly between the moon and the sun, so its shadow is cast on the moon. From Earth's viewpoint, we see a lunar eclipse. The plane of the moon's orbit around Earth isn't precisely aligned with the plane of the Earth's orbit around the sun so on most months we don't see an eclipse. The next lunar eclipse—which will be visible throughout much of Asia, Europe, Africa and Australia—will occur on Aug. 7. A solar eclipse happens when the moon blocks our view of the sun. This can only happen at a new moon, when the moon's orbit positions it between the sun and Earth—but this doesn't happen every month. As mentioned above, the plane of the moon's orbit around Earth isn't precisely aligned with the plane of the Earth's orbit around the sun so, from Earth's view, on most months we see the moon passing above or below the sun. A solar eclipse happens only on those new moons where the alignment of all three bodies are in a perfectly straight line. When the moon blocks all of the sun's light, a total eclipse occurs, but when the moon is farther away—making it appear smaller from our vantage point on Earth—it blocks most, but not all of the sun. This is called an annular eclipse, which leaves a ring of the sun's light still visible from around the moon. This alignment usually occurs every year or two, but is only visible from a small area on Earth. On Aug. 21, a total solar eclipse will move across America. 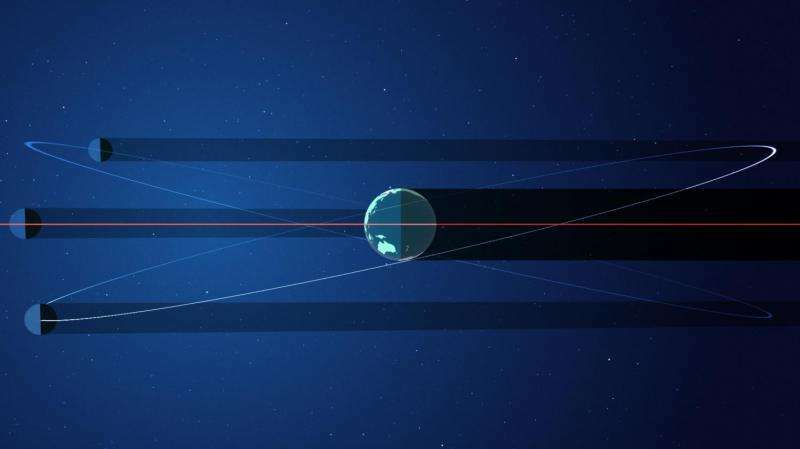 While lunar eclipses are visible from entire hemispheres of Earth, a total solar eclipse is visible only from a narrow band along Earth's surface. Since this eclipse will take about an hour and a half to cross an entire continent, it is particularly important scientifically, as it allows observations from many places for an extended duration of time. NASA has funded 11 projects to take advantage of the 2017 eclipse and study its effects on Earth as well as study the sun's atmosphere. An eclipse is really just a special kind of transit—which is when any celestial body passes in front of another. From Earth we are able to watch transits such as Mercury and Venus passing in front of the sun. But such transits also offer a way to spot new distant worlds. When a planet in another star system passes in front of its host star, it blocks some of the star's light—making it appear slightly dimmer. By watching for changes in the amount of light over time, we can deduce the presence of a planet. This method has been used to discover thousands of planets, including the TRAPPIST-1 planets.